Retired as a research chemist from E. I. DuPont de Nemours & Co. after a 27-year career, R. Martin “Marty” Guidry of Louisiana has studied the genealogy and history of the Acadians for over 40 years as an avocation. His work focuses on the culture, language, history and genealogy of the Acadian people from the early 1600s to the present. Guidry is immediate past-president of the board of directors of the Acadian Memorial Foundation in St. Martinville, Louisiana and continues to serve as a member of the board. He is president of Les Guédry d’Asteur–the North American association of the Guédry family. Guidry has published numerous articles on Acadian history and genealogy, presented seminars on the subject and conducted genealogical workshops. He has organized and held Guédry family reunions in Louisiana, Nova Scotia, New Brunswick and Maine. He contributed the article Acadians in Michigan to the book Acadie Then and Now–A People’s History, to be released on Louisiana Day–August 18, 2014–at the Congrès mondial acadien 2014 in Grand Falls, New Brunswick. Born in Abbeville, LA, Guidry spent his early life throughout southwestern Louisiana from Lake Charles to Lafayette. He received his high school diploma from Lafayette High School in 1966. After graduating from the University of Southwestern Louisiana (now ULL) in 1970 with a B. S. in chemistry, he attended the University of Illinois at Urbana-Champaign where he received a PhD in organic chemistry in 1974. On an educational delay from the U. S. Air Force while attending graduate school, Guidry began his military service doing research at the Frank J. Seiler Research Laboratory at the USAF Academy and also was an associate professor of chemistry at the academy. In 1978, he joined the DuPont Company in research and development while remaining in the USAF Reserves. Over the next 27 years he worked in research and development and environmental regulatory affairs with DuPont at Orange, TX; Lake Charles, LA; Aiken, SC and LaPlace, LA from where he retired in 2007. In 1996, he retired from the USAF at a Lt. Colonel after four years of active duty and 22 years in the Reserves. Guidry is married to the former Ann Morris of Franklin, LA and has two daughters Renée and Cherie. He now stays active doing genealogical research, birding, and enjoying his grandsons. 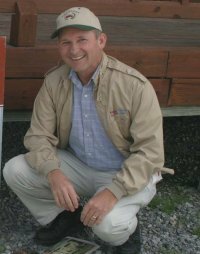 For several years, he has served as president and in other leadership positions of the Louisiana Ornithological Society and leads birding field trips for several nature organizations.